F. Scott Fitzgerald’s “The Great Gatsby”, a novel commonly studied in upperclassmen English courses, begins with some advice: “Whenever you feel like criticizing any one, just remember that all the people in this world haven’t had the advantages that you’ve had.” Students must take this to heart whenever they decide to criticize their teachers. Teachers do not possess the “advantage” of knowing precisely how their policies impact the lives of their pupils. It is therefore all too easy for students to find unreasonable fault with their teachers’ classrooms, homework and test policies, and to disparage their teachers as unfair, cruel individuals. 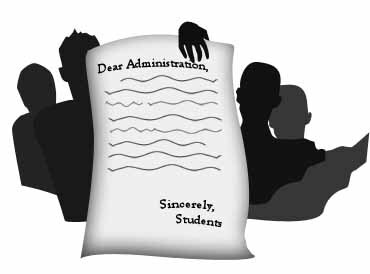 Even though constructive criticism for teachers by students is warranted and requested by the district, it is vital that students refrain from over criticizing their teachers or denouncing them inappropriately without proper rationale. Essentially, students should appreciate their teachers’ efforts to maintain a positive learning environment and state whatever grievances they may have in a polite, professional and constructive manner. Part of this tactic involves students accepting responsibility for their own actions and habits. With some exceptions, teachers are not necessarily to blame for low marks on tests, essays, lab reports and other assignments. Rather than attribute a low score to the supposedly unfair policies of a teacher, students might find amending their study habits to be a more productive response to an undesirable grade. Similarly, it is unjust for students to hold teachers accountable for their marked tardies and cuts. Teachers cannot physically compel their students to wake up early enough to get to school on time every morning. It is strictly the requirement of the teacher to mark students late or absent if students are, in fact, late or absent. Many complaints involve more serious matters. According to the administration, some of the most common reasons for filing a complaint against a teacher involve constructing unit tests that cover material not discussed in class, not grading work in a timely manner and not connecting with students. If that or something similar occurs, there are steps students can take to politely suggest amendments to the teacher’s policies. It is customary for teachers at the end of a semester or school year to request student evaluations. This provides a forum for constructive criticism, which can allow the teacher to avoid making the same error in future classes. The fact that evaluations can be filled out anonymously prevents the teacher from knowing which student completed a certain evaluation. A more immediate step, according to instructional supervisors, involves speaking to the teacher directly about the problem. This allows the opportunity for the teacher to correct the mistake in a more efficient manner. If, for some reason, the teacher does not correct the error, the student can visit the instructional supervisor of the teacher’s department and explain the problem. Depending on the severity of the error, the instructional supervisor might talk to the teacher and provide the support the teacher needs to correct the classroom policy or behavior. Students must remember that teachers generally want the best for them and do not want to be left in the dark about a pertinent issue. If a student’s piece of criticism is both legitimate and worthwhile, the teacher would likely take steps to correct the error. The measures students use to criticize their teachers can be taken to the extreme. Some students go as far as to complain and rant on Facebook and other public threads. Students should realize there are more productive and effective ways of criticizing teachers than by using an online forum. Such an action does not accomplish anything useful.